Pregnant women often develop varicose veins during their pregnancies. There are two main reasons for this. Pregnancy increases the volume of blood in a woman’s body, which, if the valves aren’t functioning properly, can increase the likelihood of veins becoming overfilled. As the woman’s abdomen and pelvic area accommodates the growing fetus, the flow of blood from the legs to the pelvis can be compromised. These changes are natural, but they can produce unfortunate side effects such as enlarged veins in the legs. Varicose veins may appear for the first time during pregnancy. It has been observed that the varicose veins may worsen during late pregnancy because the expanding uterus exerts greater pressure on the veins in the legs. Exercise: Walking is a great way to encourage healthy levels of blood circulation in the legs. A doctor can recommend an appropriate activity level for any patient’s body type and age. Maintain a healthy weight and diet:Shedding excess pounds takes unnecessary pressure off of veins, especially those in the legs. Following a low-salt, high-fiber diet to prevent the swelling that may result from water retention and constipation is also recommended. Make healthy fashion choices: Wearing low-heeled shoes allows calf muscles to work more, which is better for vein health. Wearing tight clothing around the waist and legs can restrict circulation. Elevate the legs:To improve venous circulation, experts recommend taking several short breaks daily to elevate legs above the level of the heart. Avoid long periods of sitting or standing:Changing the body’s position frequently to encourage blood flow can be beneficial. 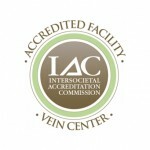 North Shore Vein Center provides comprehensive treatment of varicose veins, spider veins and venous disease. We utilize the latest in minimally invasive vein treatment technology and perform outpatient procedures in our comfortable outpatient office. Contact us today to schedule your consultation. Copyright © 2019 North Shore Vein Center. All rights reserved.